CAPE CANAVERAL, Florida -- NASA's Solar Dynamics Observatory captured this picture of the sun on June 18, 2013, showing a huge coronal hole – seen here in dark blue - spread out over almost the entire upper left quadrant of the sun. A coronal hole is an area of the sun's atmosphere, the corona, where the magnetic field opens up and the material flows quickly out. This results in a cooler and less dense atmosphere than the surrounding areas. This coronal hole is at least 400,000 miles across, which is more than 50 Earths side by side. Coronal holes spew out fast solar wind, probably traveling at about 400-500 miles per second. This is roughly twice the speed of the normal solar wind, the solar material that is constantly streaming off the sun in every direction to fill the solar system. 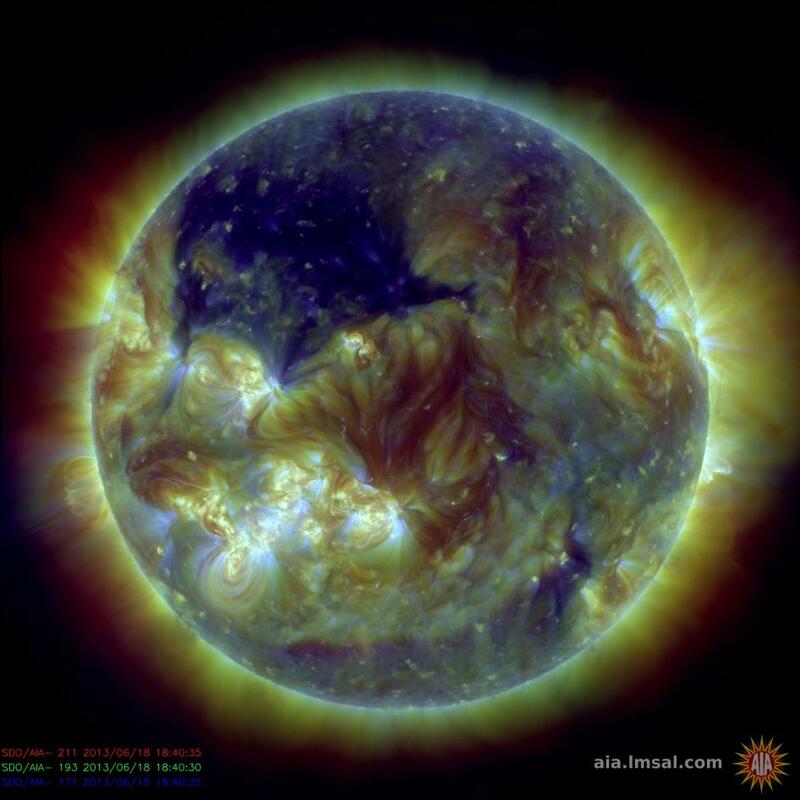 This image of the sun from June 18, 2013, shows a coronal hole – that is, an area of cooler, less dense material in the sun's atmosphere, the corona - in the upper left side, represented in blue. In this image from NASA's Solar Dynamics Observatory, the blue color represents light in the 171 Angstrom wavelength, which shows the coolest material present in the image. Two other wavelengths of light are also shown in the picture: 211 Angstroms, in red, and 193 Angstroms in brown.